On your wedding day you may have guests that arrive in the morning and remain with you throughout the whole day - sometimes it will be cold, sometimes it will be hot. You may have long gaps with your guests waiting around, for example during the photography. With careful preparation and planning you can ensure that your guests don't get thirsty or hungry and if the weather is hot , or cold, that they can have something to eat or drink that cools them down, or warms them up. Getting your drinks and canapés right can be the difference between your guests enjoying your weddings as one long celebration and them enduring your wedding with long gaps, being hungry or thirsty or too hot or cold. We will take a look at planning your wedding drinks first, then at your wedding canapés. Calculating when and how many drinks per guest at your wedding reception can be a daunting experience if you are on a budget. As a rough guide drinks are usually served to guests when they arrive at your venue as well as during the speeches and toasts. Depending on your budget and type of wedding, you can determine when and how much you offer your guests to drink. You can supply the drinks during the meal and over the course of the evening, or choose to give drinks on arrival, during the meal and speeches. If the venue allows you to bring your own, you could have a barrel of beer for those guests who are not wine or cocktail drinkers. Put some money behind the bar or leave tokens on the tables for a set amount of drinks for each guest. Some venues will charge corkage if you take your own wine or champagne, but this could work out cheaper than buying the hotel's own brand. To help work out your drinks quota per guest, a bottle of 26oz wine yields 5 glasses while a bottle of average champagne will yield 6 flute glasses. Don't be concerned about choosing the most expensive wine for your reception, as long as it's good quality your guests will be happy. For almost all of them it will be the taste, not the cost, which interests them! There are some very acceptable Cava's on offer that could be used instead of champagne and would help if you are on a tight budget. If you are going to offer both red and white wine it may be a good idea to try and find out which particular variety is more popular with your guests. Punches and cocktails are becoming more popular at receptions, more so if you are having a summer or beach wedding. Delight your guests with cocktail glasses and tiny umbrellas with coloured straws and sparklers. If you decide to make your own cocktail punch, remember that one bottle of spirit with 3 liters of mix or juice will give you 30 servings. Allow one and a half servings of punch per person. Why not break away from the traditional use of champagne for the toasts and use your punch. If your wedding is in the Summer chances are it will be hot (well, at least warm!) so your selection of drinks should be cool and refreshing. A 'pretty' drink with layers of orange and red that could be served at sunset during your reception or in the afternoon sun. Serve this sparkling drink with ice cubes and edible flowers frozen inside, garnish with fruit or mint leaves. Chill all ingredients. In a large punch bowl combine peach nectar, concentrated orange juice, lemon juice, brandy and grenadine. Mix well and pour in the carbonated water and champagne. For a budget wise bride the traditional wedding punch is easy to make and can be topped up at regular intervals with ease. Mix together and place in punch bowl with plenty of ice. 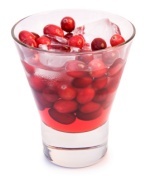 A non-alcohol punch can be made by just omitting the vodka. Pimms have reintroduced their Winter Cup which is a brandy based winter warmer. 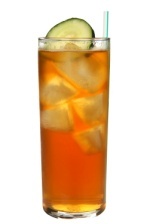 Rich robust spices with orange, this drink can be mixed with apple juice or ginger ale and served warm. If you are having a winter wedding having drinks that are hot and smooth can really help to take the chill out of standing around outside whilst photos are taken. Mix advocaat and lime juice together, pour into ice filled tall glass and top up with lemonade. A white creamy drink ideal for winter weddings, but watch out, this can have a kick to it. This recipe is for a punch bowl. Pour all ingredients into a large bowl and mix together. If possible place on top of larger bowl filled with ice cubes. A classic warm drink to offer your guests, to keep the chill out after leaving the ceremony room or church and having photographs taken, is a nice warm cider punch. Pour the Southern Comfort or bourbon into a bowl; add the crushed berries and cinnamon sticks with the sliced apple and medium sweet cider. Microwave on high till its warm throughout. Cinnamon sticks can be taken out of bowl and placed in glasses before serving. Others choices to name a few are bucks fizz, sangria, sherry or good old fashioned 'can't go wrong' champagne and strawberries. There are many drinks that can be used for whatever time of the year, nothing is set in stone when you can have them; it is entirely up to individual preference. The word canapé comes from ancient Greece and has certainly come a long way from the prawn and lettuce on brown bread variety. It is a curious word inasmuch that 'konops' was a mosquito and curtains called 'konopion' were hung around the couch to keep the pesky insects away by the Greeks. The French used the word 'canapé' for the couch, as opposed to the curtain, because they thought the piece of toast topped with savory food looked like a couch. The word then took on a new meaning in French and we 'borrowed' the word into English. 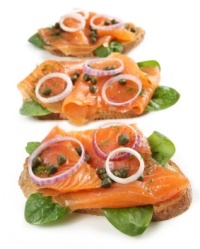 Canapés can be crackers, small slices of bread or toast, pastries or fruit bases. 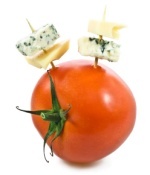 They are cut into various shapes and garnished with savory or sweet toppings. Fish, cheese, meats, purees, fruit and vegetables can all be placed onto an open base and decorated into a wonderful mouthwatering delight. You can serve canapés to your guests at any time during your wedding reception, from arrival with drinks to keeping your guests happy while the photographs are being taken, or in the evening as light refreshment. If your wedding is a small one with close family and friends, you can have a reception of drinks and canapés. With the many varieties available there is certainly sufficient to keep yourselves and guests happy. Remember to cater for any vegetarians and wheat tolerance guests. Canapés can be served in a way that mirrors a three course meal with the first tray consisting of fish and seafood nibbles with chunks of melon and Parma ham, accompanied by crudites and dips. Canapés based on roasted meats and vegetables can be served as the second 'course while delicacies such as canapés of sweets, fruit, chocolate and cheesecake can be considered as the desert. If you wanted to give your guests that little bit extra, servings of cheese bases with grapes and celery canapés can be handed around. Coffee could be handed round at the same time as the cheese selection with tiny chocolate mints. A change of wine to compliment each serving could also be given. Keep the wines soft to the palate and spend time to match them to the different foods. You can have a non alcohol fruit punch taking pride of place on the table if you are planning on having your canapés for guest to choose themselves rather than have them handed around the room by servers. The punch bowl can have a colourful assortment of fruits and cheeses, or flowers of the seasons. Depending on which season you get married and where you hold your reception can vary the choices of your canapés. If you are holding your reception outside it would not be ideal to serve fish or chocolate nibbles to your guests. The sun can quickly turn them into an ugly sometimes smelly unpalatable canapé. 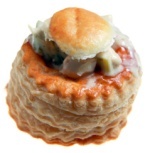 Have your canapé reflect the theme or colours of your wedding. A summer outdoor wedding could have cool and colourful canapés with pink sparkling wine while a winter wedding reception can give your guests the chance to nibble on hot and spicy delicacies while sipping hot punch or mugs of hot chocolate piled high with fresh cream. If you are having children attend your reception, why not keep them happy with having children only platters that can be savory or sweet that will appeal to your younger guests, while at the same time making them feel they are eating 'grown up' food. Platters for children can be miniature hamburgers, fish and chips or hot dogs with deserts of fruit pies, mini jelly tarts and cheesecake. Discuss with your venue if they offer a children's' platter. Canapés can be served at any time during your reception. From the arrival to late evening that's the beauty of nibbles. Instead of a starter, offer a small selection of them, or have individual platters on the tables during the evening instead of a buffet. If you decide to offer canapés to your wedding guests, the hardest part will be choosing which ones to pick as the selections are vast and varied. Always discuss with your venue as prices can vary from menu to seasons. You could even have a go at making your own recipes!